The Shweeb racer is an innovative Kiwi invention; it’s fun, fast and the first of its kind in the world. Not only is the dynamic, pedal-powered racing ride at Velocity Valley heaps of fun, but it’s also potentially an ingenious solution to the world’s increasingly challenging transportation challenges. How’s that for a great idea, bursting with multi-purpose genius? After the Shweeb concept was submitted to tech giant Google as part of an initiative they were running to select and support ‘ideas that will change the world’, the idea was considered to be one of the most innovative future eco-friendly forms of public transportation. Google liked it so much they invested $US 1M in developing the concept – how cool is that! Shweeb racing speeds can reach up to 50 kilometres an hour, with 60-degree angles on the bends! 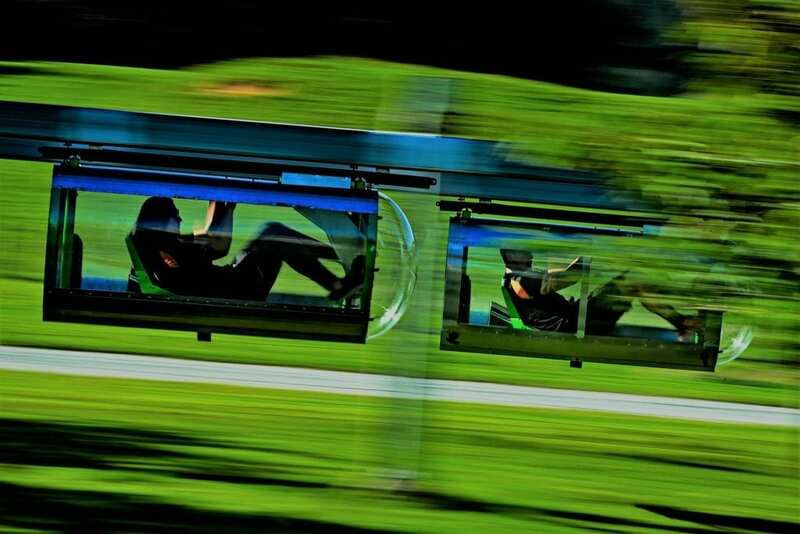 If you’re not familiar with the Shweeb racer, here’s how it works: the Shweeb is a pedal-powered, aerodynamic pod that hangs from a monorail above. Shweeb riders get into the pod, lie back in a recumbent position, and pedal like crazy. There are seven gears to push through and, as you get those legs pumping, the pod excels to speeds of over 40 kilometres per hour with surprisingly little effort. If you’ve got some serious power in those pins, you can reach speeds of 50 kilometres per hour. And the faster you go, the wider the pods swing out around the corners. The Shweeb racer was recently electrified, making it more accessible for all ages as the pedal assist means it’s easier to get moving. It’s also great for achieving higher speeds – perfect for even more exhilaration and for those that like a dose of healthy competition! You can race the clock (and the world record if you like), or you can race your friends and family. At Velocity Valley there are two pods, and you can race three laps around the 200-metre track. It’s a blast! Be prepared for some wobbly legs by the end of it though. Test your stamina, earn your bragging rights and enjoy the ride! The current world record is 55 seconds for the 600m ­– good luck smashing that! When you’re exploring a new country, it’s always the new experiences, the once-in-a-lifetime things you can’t do at home, that create the really exceptional moments that you remember forever. 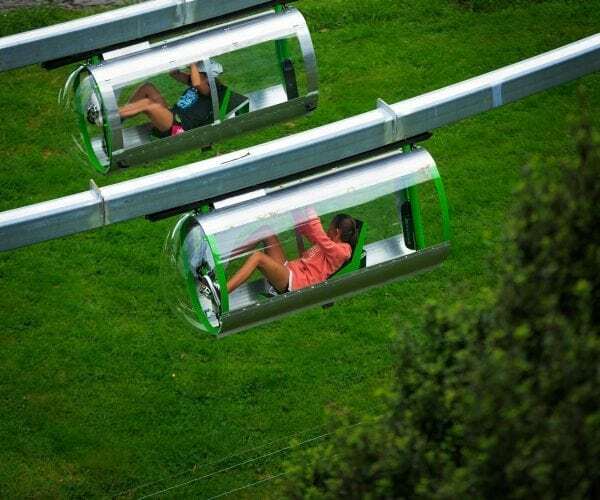 Velocity Valley is known for having New Zealand’s best adventure experiences, all in one location – so it made sense as the perfect place for the public to enjoy the Shweeb invention. Where else can you experience the adrenaline-fuelled excitement of six kiwi invented adventure experiences amidst beautiful rolling hills? Nowhere! So, bring your friends or family for an incredible day out, and race the fast and furious pedal-powered Shweeb at Velocity Valley Adventure Park.